Host icebreaker gains "2credit: +4 strength." If Dedicated Processor is hosted on an icebreaker that is hosted on Baba Yaga, does Baba Yaga gain "2: +4 strength."? A solid mod to help out many an icebreaker. Only Breach and Golden already have a pump-to-strength cost to match this. And only Sharpshooter is better (not counting stealth breakers). Yog.0 - Under most circumstances, Yog will be able to break all but three codegates in the entire card-pool for just 2 (if it can't break it for 0 that is). Orion and Fairchild will cost 4 and Tollbooth will cost 5. Mimic - For a long time this was the most used killer in the game. An influx of high strength sentries has curbed its use to that of a backup. Dedicated Processor will let it break any sentry quite efficiently. Morning Star - Break all barriers in the game for 1 - 5. Femme Fatale - A great card to get past those annoying Tollbooths and Data Ravens, but one that was super costly to use if you face-planted into an Archer without an alternative. Now break Archer for just 6. Pipeline or Dagger - Use these in faction as your killer to save on precious influence (and memory in the case of Dagger). The smart people breakers - You could try using Dedicated Processor instead of boatloads of memory to make one of these work. The main advantages this has over Dinosaurus is that it is cheaper, and more importantly, it can (must actually) be installed after the breaker. This way you can at least make somewhat less risky runs with your Yog or Mimic as you wait to find your Processor. 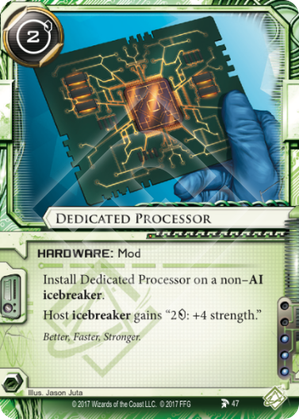 As the actual icebreaker gains the ability, cards like Cloak and Multithreader can be used in conjunction with Dedicated Processor. It is a Hardware so it is a bit more difficult to trash directly, but of course it will be trashed if its host is trashed. A good card that I expect to see played quite a bit. Shapers will probably be importing Yog.0 and maybe a couple others. And I'm sure we will see it as a one-of in a few Criminal and Anarch decks as well.